I am based in Singapore, a little red dot in Asia. I am also available to travel around the world to photograph your precious moments. If you are looking for a photographer who can capture the very essence of your wedding without posing and intervening, you have come to the right place :) As a story-telling wedding photographer who has very strong belief in “photojournalism”, my mission is to document the authentic story of your once-in-a-life-time event and your personalities by capturing the precious moments unobtrusively and artistically. However, I also love to look for special on-location elements to create beautiful portraits that portrays the loving relationship between the couple. Simple posing guidance will be given to you to ensure you look natural and gorgeous in the photographs. 3. How many years of experience do you have? I’ve been photographing weddings and portraits since January 2011 with more than 400 wedding assignments over the years. 4. We are just engaged. What do we do next? Congratulations! It’s time to enjoy the wedding planning process :) It would be better to discuss together with your partner to set the priorities of the wedding needs and make the booking accordingly. For example, if hiring a good photographer/videographer to capture the precious moments of your wedding day is your first priority, you should book your wedding day photographer/videographer first before you book the wedding gowns and pre-wedding photography package. Reason being the wedding day photographer/videographer whose style you love most may not be available on your wedding date if you book late while wedding gowns and pre-wedding photography package can be booked anytime without the need of a particular date. 5. What is your pricing? You may contact me for the package details via the Contact in the menu on the left and I will get back to you within 2 days. If you do not receive my reply, it could be dropped into the spam/junk folder in your mailbox. 6. Your pricing is above our budget. Are you able to offer some discounts? 7. Your pricing is higher than other photographers that we shortlisted. Are you able to lower your pricing to match theirs? 8. Do you provide gowns & suits? No, I don’t, as I would like to fully focus on the photography part to deliver the best quality photographs to the wedding couples. I also don’t tie up with any bridal boutique at the moment. 9. Is a good quality wedding gown important for the photos? Yes, a good quality wedding gown is very important indeed as it can never be photoshopped. A good quality gown that is well designed to match the personalities and body curves of the bride will bring out the aura of elegance of the bride in the photos(and in the video too). You may visit some great local gown designers like Vaughn Tan, Divine Couture, Rebecca Caroline, The Proposal Bridal, Dang Bridal, etc for your perfect gown. 10. Are you the same as those bridal studios? Nope, I’m not the same as those bridal studios who provide one-stop-services in mass volume, like wedding gowns, make-up, bridal car, bouquet, etc. I’m only specialized in the art of wedding photography and portraitures with unique style and only take a limited number of assignment every year. Hence my pricing and service structure are very different to the bridal studios. If you need good recommendation of make-up artists, wedding gowns, etc, you can visit my page Recommended Vendors. 11. Do you photograph group photos and details? Yes I do. 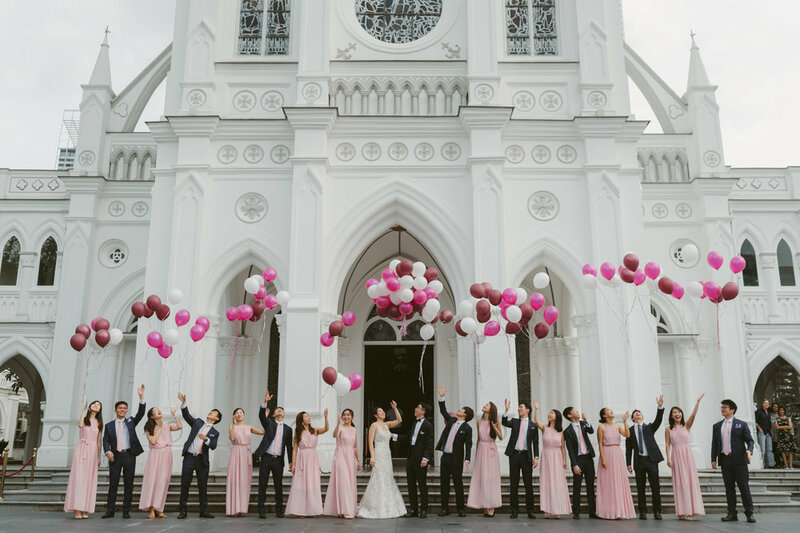 Besides the candid moments, group photos and details are also important part of your wedding photography collection, especially the family photos! If you need more group photos, a photo booth service or a second photographer can be hired and therefore the main photographer can focus more on capturing the candid moments. 12. Where can we see your latest portfolio online? You can always follow my Facebook Page and Instagram for my latest portfolio and updates. I will update my website as frequent as possible, with more comprehensive showcase of the weddings I’ve photographed. 13. Do you provide childhood montage service? No, I don’t. You can try Animoto online for their simple and nice slideshow. 14. How long in advance should we send you an enquiry or make a booking? Once you know your wedding date, you can contact me for my availability and photography packages. I am receiving enquiries/bookings up to 1.5 years in advance from some wedding couples who plan their wedding early, so it is always better to save your date with me as soon as it is possible for you. 15. Can we make the booking if we are not sure the number of hours needed for the photography on our wedding day? The traditional Chinese weddings in Singapore usually need 10 hours of photography coverage – 5 hours for the morning customary and 5 hours for the banquet or 6 hours for the morning customary and 4 hours for the banquet. For weddings with church ceremony, it could be 11 or 12 hours sometimes. Nevertheless, if you are not sure, you can make the booking for 6 hours or 8 hours first so that I can reserve the date for you. And you can top up the number of hours at later stage or on the wedding day itself if necessary. 16. How can we reserve your photography service? What are the payment methods? For reservation, a signed agreement and 50% deposit are required. You may make the payment in cash, cheque, PayPal or online bank transfer. Once it’s done, your date is then fully reserved, and I will not accept any other clients for that date. The remaining balance will be due on or before the shooting date. 17. What will happen after the reservation? After the reservation, about 2 to 3 weeks before your wedding date, we will arrange a meet-up either at my studio or via Skype to catch up and discuss the flow of your wedding. I will advise you the tips and things to take note to keep your wedding activities running smoothly and ensure the perfect moments are well captured. Similarly for pre-wedding photography, we will meet up for discussion 2 to 3 weeks prior the shoot too. And in between if you have any queries, please feel free to drop me an email or whatsapp and I will get back to you as soon as possible.